I did not feel like having a cocktail as we came back from a visit at the San Diego Distillery and I had enough whisky. So I ended up trying their house made apple juice that was pretty good and flavorful. It was followed by an amuse that was their take on deviled eggs where the egg white was replaced by a meringue: simply delicious! 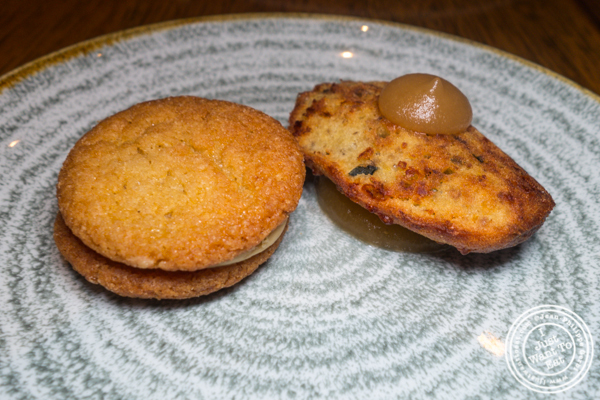 - foie gras cookie with miso and a fig jam that was the kind of cookie that does not need milk. 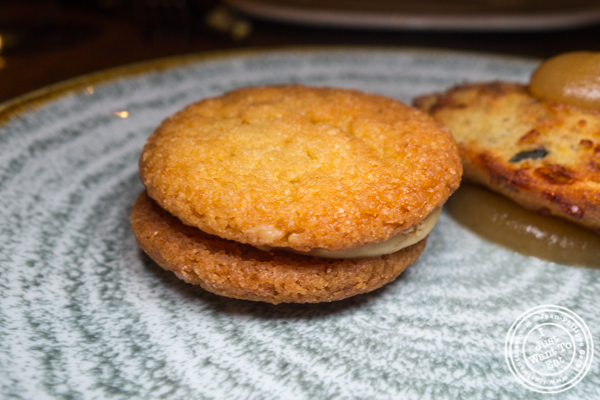 Very good, crumbly, the foie gras definitely went through. 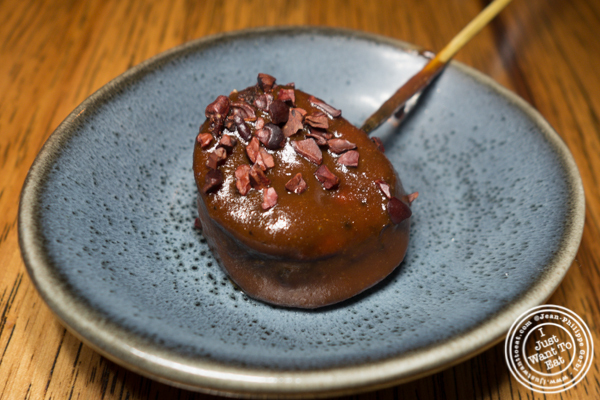 - bison sausage with cocoa BBQ sauce: very good, I could have had more. - Mushroom and Swiss Madeleine: a delicious twist on a classic. You could for sure taste the mushroom. 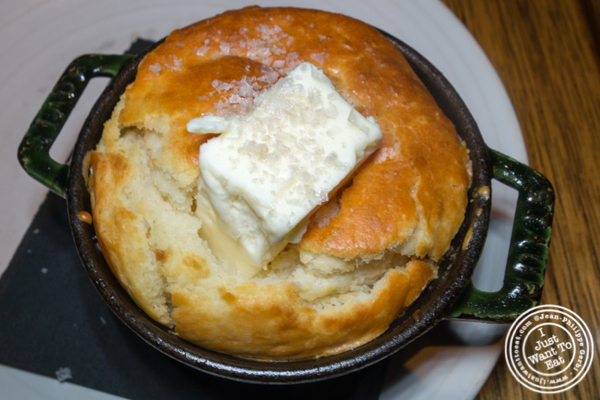 Then, we ordered their house made biscuit that was topped with a big chunk of butter that slowly melted as the biscuit was hot. This was fantastic: from the rustic presentation to the taste that was fantastic. On my side, I chose the foie gras tart, enjoying foie gras before the ban took effect few days after in California. 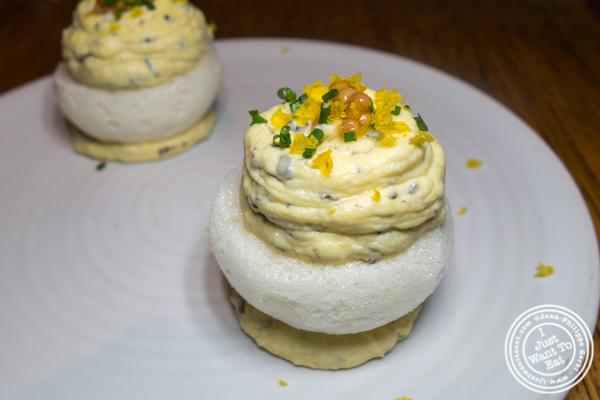 I thought it was a great take on the classic foie gras and brioche or bread. Served with a caramelized apple jelly and roasted chestnut, it was like a Holiday dish for me, perfect for the Christmas /New Year period. For her main, Jodi got the citrus salad with kumquat dressing and chicories. Colorful, it had unfortunately too much kumquat that overpowered the whole dish and was too sweet. 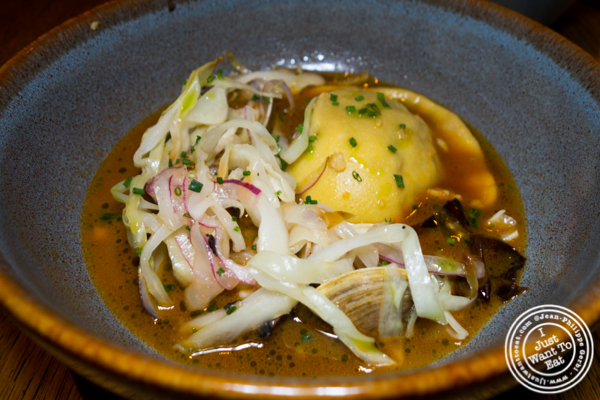 On my side, I picked the raviolo, a big ravioli (I know I should say raviolo as there was only one) stuffed with braised lamb neck in a posole broth (a corn Mexican broth) with Manila clams. It was a sort of surf and turf, with all the components working very well together. 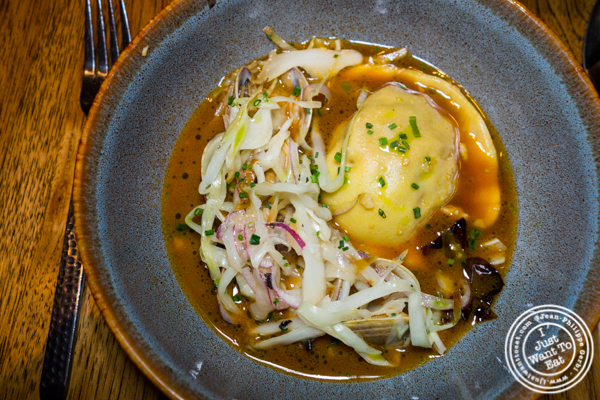 The raviolo was perfectly made, and the braised lamb sublime. 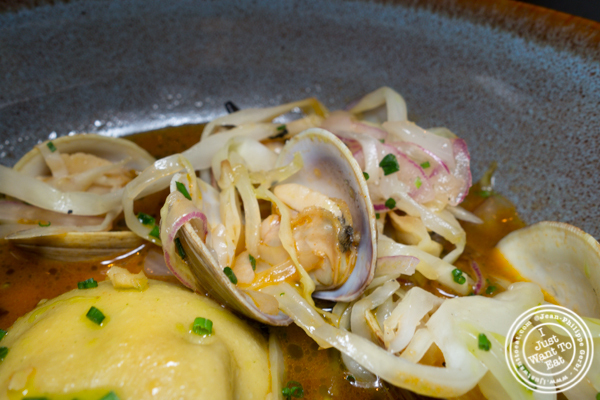 But what was even better was the broth that had a lot of depth. Superb! We did not have dessert as we were full and anyway did not see anything exciting on the menu. 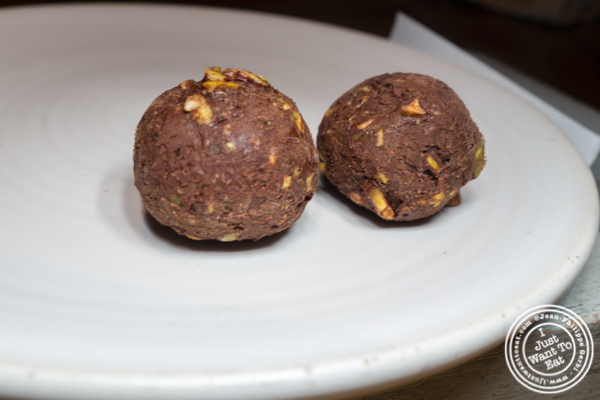 But, with the bill, they brought us some chocolates that were a nice touch to end the meal. 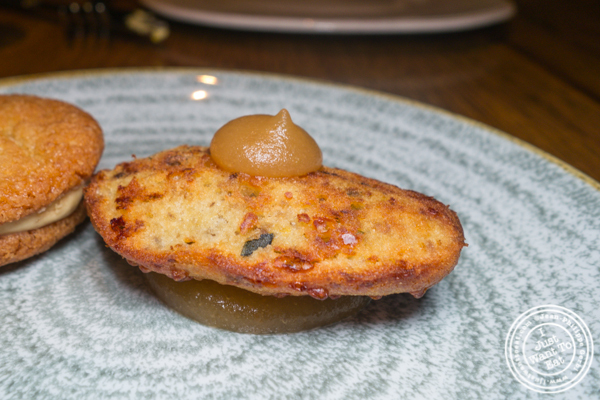 Overall I liked the meal at Juniper and Ivy. As I mentioned before, the menu caters more to non-vegetarian with original dishes and so many choices that you kind of get overwhelmed. But still, I enjoyed.